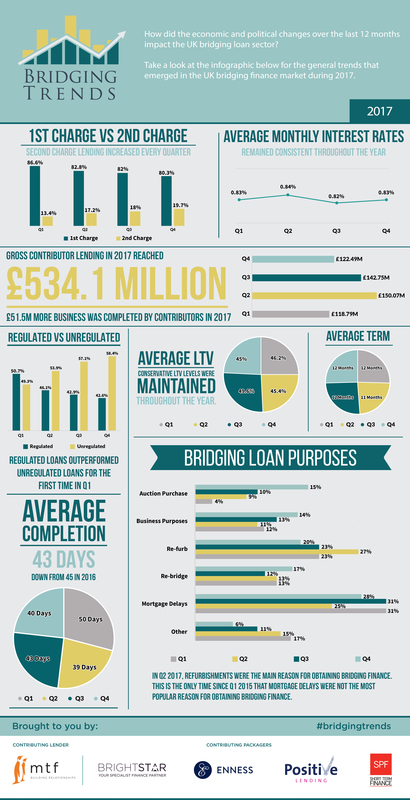 Take a look at the infographic below to see the trends that shaped the bridging finance market in 2017. “The continued growth in lending volume in this sector, as reflected by the data reported by the contributing parties over the year, evidences the extent to which bridging finance is now increasingly a mainstream financial solution. “It is interesting to note the what appears to be a direct correlation between the data reported and the macro-economic and regulatory changes which have impacted upon the market. We have, for example, in this annual reporting cycle, seen regulated bridging finance lending outstrip unregulated bridging finance for the first time. This follows on from the implementation of the mortgage credit directive and the consequential introduction of a new class of regulated “consumer” buy to let lending. “Equally we are interested to note that again for the first time since reporting began, refurbishment to existing investment property was the most popular reason for borrowing during Q2 of last year. This follows on from increases in the stamp duty taxes payable on the acquisition of new buy-to-let properties and indicates a potential strategy shift amongst professional property investors towards value enhancement. “Between stamp duty costs and stagnation in the London property market, it’s no wonder bridging finance for refurbishment is becoming increasingly popular. To avoid heft stamp duty charges, many more clients have been buying cheaper or outdated properties, and using second charge bridging finance to update them before refinancing onto a residential product. Likewise, we’ve seen numerous client looks to raise money against their properties who do not want to refinance altogether. As such, they’re using regulated bridges as second charges against their property, in order to keep their attractive first charge mortgage whilst securing the extra funds they need.